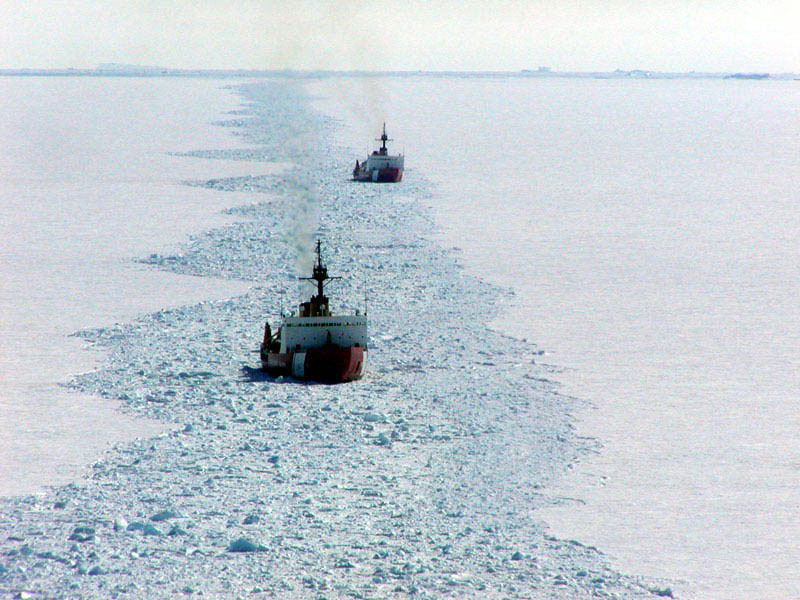 The heavy ice breakers Polar Star and Polar Sea create an access channel for supply ships in McMurdo Sound, during the 2002 Deep Freeze Mission. The Polar Sea is now in caretaker status and could be decommissioned. The Polar Star has undergone a thee-year $90 million overhaul. Courtesy U.S Coast Guard. The number of ships through the Bering Strait grew 118 percent between 2008 and 2012, according to the U.S. Coast Guard. As nations attempt to stake claims for rich Arctic resources, the U.S. currently has little presence there. The Coast Guard has two ice breakers capable of operating in the region. That’s four short of the six required to fulfill the agency’s mission in both the Arctic and Antarctic. One of those cutters, the Polar Star, is back in service after a major rebuild. Here’s a look as part of our occasional series on Coast Guard cutters that visit Juneau. Several staggered metal ladders aft the bridge go straight up to a perch called the Aloft Conning Station. Kenneth Boda is Executive Officer aboard the Coast Guard heavy ice breaker Polar Star. It’s his third ice breaker tour. The Aloft Con is 110 feet above waterline on the Polar Star, under the command of Capt. George Pellissier. “Most of the time in the ice you’re driving from there,” he explained during a recent interview when the ship stopped in Juneau after Arctic ice trials. Pellissier will command the ship to Antarctica this winter. The ice breaker’s primary mission there is to resupplyMcMurdo Station, the largest U.S. research station at the South Pole and the logistics center for other Antarctic facilities. Pellissier said two-thirds of the job is transit time. Then there’s the ice. “You have to break a channel through the fast ice, which is ice that’s attached to the land, and then you have to make a channel straight enough and wide enough to get a container ship and a tanker in,” he said. The upcoming Antarctic trip – called the Deep Freeze mission — will be the first in recent years for a U.S. ice breaker. The Coast Guard has had to lease Swedish and Russian ice breakers. With only one heavy and one medium ice breaker in the Coast Guard fleet, “there’s no bench strength,” Pellissier said. The latest study prepared for the Coast Guard indicates the need for three medium and three heavy ice breakers to fulfill U.S. statutory duties in the polar regions. The Arctic poses the most immediate challenge. The Coast Guard is responsible for law enforcement, search and rescue, security, and environmental protection where many nations want to drill, mine, fish, and tour. The ice breakers are also scientific research platforms. U.S. Homeland Security predicts a million adventure tourists could visit the Arctic this year. Other nations have government and commercial ice breakers operating in the region year around. Commander Pellissier points to the region on a large map in his Polar Star office. The window is narrow now, but as the ice diminishes ships could go through the Chukchi and Beaufort seas to the Northwest Passage, linking the Pacific and Atlantic Oceans. “If the ice continues to recede, which most scientists are predicting it will, then that route will also become much more viable in the future, pretty much cutting through all the small islands up in the northern part of Canada, and then down through the Labrador Sea and down the East Coast,” Pellissier said. The new National Security Cutters are the core of the Coast Guard fleet. Despite their versatility, they can’t cut ice. “They have a very limited window of time they can operate, particularly up in the North Bering and beyond. The ice breakers, particularly our heavy ice breakers, can stay up there year around,” Pellissier said. Multiple studies indicate the U.S. needs a year-round presence in the Arctic. Existing ice breaker capacity is not enough, even with additional non-ice cutters and aircraft, more operating locations and improved communication and navigation systems.